Improve your understanding of the science of modern microphones and how to use them to get the best possible result. 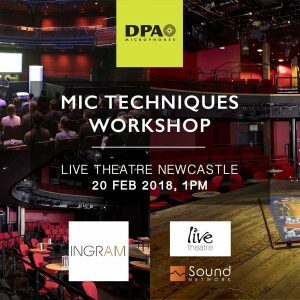 We are hosting a free microphone techniques workshop along with DPA Microphones and Ingram AV at the Live Theatre Newcastle on the 20th February. Presented by DPA Master Les Mommsen, the workshop will be a hands-on demonstration of the how understanding microphones better will make your job easier and give better results, whether you work in studio, corporate, live or theatre sound. Come and hear the results first hand, with live musicians and speakers to demonstrate different mics, positions and techniques, and get your hands on the latest in professional mic technology from DPA Microphones. For more information please contact Ingram AV or email us at [email protected]. We look forward to seeing you there.